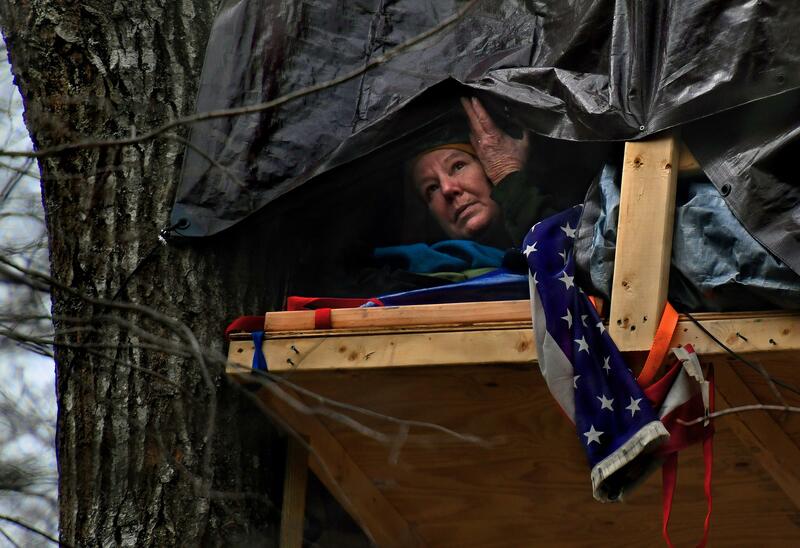 UPDATED: Sun., April 22, 2018, 9:27 p.m.
ROANOKE COUNTY, Va. – When the trees started coming down, Theresa “Red” Terry went up. It’s the farther along of two gas pipelines planned in Virginia. An even bigger project, the Atlantic Coast Pipeline, is being built through the central part of the state by a coalition led by Dominion Energy, the state’s largest utility. The two pipelines have thrown together environmentalists; although property rights advocates have tried to block them, the projects have won political and regulatory support at every turn. Last Wednesday, a group of Democratic state lawmakers from northern Virginia and Richmond joined with others from the southwestern part of the state to call on Gov. Ralph Northam, D, to slow both projects, a sign that the issue is expanding beyond a regional concern. Though Northam’s office said there is nothing the governor can do, because the project has won federal approval, the State Water Control Board has approved a new 30-day comment period for the public to weigh in on whether waterway protections are adequate. Coles Terry III, his brother, a sister and other family members own about 1,500 acres near the Blue Ridge Parkway – crisscrossed with streams, full of old hay fields surrounded by deep woods and narrow dirt lanes winding up rocky slopes. “She was torn up. And I was sitting over here and every time one of these trees hit the ground it was like driving a nail in my head,” her father said. That same day, police came to read her an official notice to get out of the tree. With community sympathy running high for the Terrys – neighbors help sit watch all day and night; local restaurants supply food and host fundraisers – Roanoke County police say they’re handling the matter as carefully as they can. But opponents are outraged that detailed review of stream-by-stream crossings was left to federal officials, despite a promise last year from Northam – when he was running for office – that the state would conduct its own review. “We’re asking – urging – demanding that our good friend Ralph Northam … work with us to find common ground,” said Del. Mark Keam, D-Fairfax, who was joined by other delegates from Prince William, Fairfax, Alexandria and Richmond to show solidarity with southwest colleagues. “We stand together, and we stand with Red,” said Del. Danica Roem, D-Prince William. The protesters are trying to draw attention not only to the trees that are being cleared but also to the water so evident around the pipeline route. In at least one spot on the Terrys’ land, a spring bubbles up from under a pile of cut trees and trickles off toward a rushing creek. The stakes marking the pipeline path run alongside the creek – at one point partway down a steep bank over the water – and through wetland areas filled with dark green skunk cabbage. Del. Sam Rasoul, D-Roanoke, has asked the state to suspend permits for soil-clearing to give more time to study water impact. He brought his children out to see Red and Minor Terry last week; on Thursday, a nearby Montessori class came out to see civil disobedience in action. But state Sen. Charles Carrico Sr., R-Richmond, said he thinks the show has gone on long enough. He has seen protests over pipelines before in his mountainous part of the state, he said. “Once it was in the ground and everything’s done, it’s out of sight, out of mind. No one says anything about it,” he said. If you want to replace coal with cleaner energy, he said, natural gas is part of the solution. And as a former state trooper, he thinks police have been more than patient with the tree sitters. “If I had a warrant, I probably would’ve been climbing the tree. That’s just the way it was in my day,” he said. Published: April 22, 2018, 10:43 a.m. Updated: April 22, 2018, 9:27 p.m.